Walt Disney first attempted unsuccessfully to adapt Alice into an animated feature film during the 1930s. However, he finally revived the idea in the 1940s. The film was originally intended to be a live-action/animated film; however, Disney decided to make it an all-animated feature in 1946. The film was considered a flop on its initial release, leading to Walt Disney showing it on television as one of the first episodes of his TV series Disneyland. It proved to be very successful on television, especially during the psychedelic era. It was eventually re-released in theaters which proved to be massively successful. The film became even more successful through merchandising and subsequent home video releases. The theme song of the same name has since become a jazz standard. While the film was critically panned on its initial release, it has since been regarded as one of Disney's greatest animated classics, notably one of the biggest cult classics in the animation medium, as well as one of the best film adaptations of Alice. A live-action adaptation of Carroll's works and animated film, Alice in Wonderland, directed by Tim Burton, was released in 2010. While her sister reads, a very bored Alice sings of her want of adventure, leading her to a riverbank. There, Alice spots a White Rabbit in a waistcoat passing by, exclaiming that he is "late for a very important date". She gives chase, following him into a large rabbit hole. She sees him leave through a tiny door, whose talking knob advises her to shrink to an appropriate height by drinking from a bottle marked "Drink Me". She does so and floats out through the keyhole in a sea of her own tears, which she cried after eating a biscuit marked "Eat Me", which caused her to grow very large. As she continues to follow the Rabbit, she meets numerous characters, including Tweedledum and Tweedledee, who recount the tale of "The Walrus and the Carpenter". Alice tracks the Rabbit to his house; he sends her to retrieve his gloves after mistaking her for his housemaid. While searching for them, she eats another cookie marked "Eat Me" from his cookie canister and grows large again, getting stuck in the house. Thinking she is a monster, he brings the Dodo over to help him get rid of her. When the Dodo decides to burn the house down, Alice escapes by eating a carrot from the Rabbit's garden, which causes her to shrink to three inches tall, and continues following him. Along the way, she meets a garden of talking flowers who initially welcome her with a song, but then mistake her for a weed and order her to leave, followed by a Caterpillar, who becomes enraged after she tells him she is distressed at her current height, as he is the same height, and turns into a butterfly. Before leaving, he advises her to eat a piece of his mushroom to alter her size. She does so and manages to return to her original height, and continues following the Rabbit. In the woods, Alice meets the Cheshire Cat, who advises her to visit the Mad Hatter or the March Hare to find out where the Rabbit is. She encounters both, along with the Dormouse, at the Hare's house having a mad tea party and celebrating their "unbirthday". They celebrate her unbirthday too, but she becomes frustrated with being interrupted every time she tries to speak. As she is about to leave, the Rabbit appears, continuing to exclaim that he is late; the Hatter examines his pocket watch and says it is "two days slow", and attempts to "fix" it by filling it with food and tea but ends up having to destroy it after it goes "mad". The Rabbit laments that his watch was an "unbirthday present", and the Hatter and Hare sing "The Unbirthday Song" to him before throwing him back into the woods. Fed up with the nonsense, Alice decides to go home, but her surroundings have completely changed and she gets lost. Fearing she is lost forever, she sits on a rock sobbing. The Cheshire Cat reappears and advises Alice to ask the Queen of Hearts for directions home, showing her a "shortcut" to the King and tyrannical Queen's castle. The Queen orders the beheading of a trio of playing card gardeners who mistakenly planted white roses instead of red ones, and invites (or rather forces) Alice to play against her in a croquet match, in which live flamingos, card guards and hedgehogs are used as equipment. The animals and card guards rig the game in favor of the Queen. The Cat appears again and plays a trick on the Queen, causing her to fall over. The Cat disappears in time to make it look like Alice was the prankster, but before the Queen can order her execution, the King suggests they have a trial. At Alice's trial, the Mad Hatter, March Hare and Dormouse are called to the stand as witnesses, briefly celebrating the Queen's unbirthday and giving her a headpiece as a present, which turns into the Cat. Chaos ensues when the Dormouse, frightened when Alice points out the Cat, runs around the courtroom. As the Queen orders Alice's execution, Alice eats the pieces of the Caterpillar's mushroom she saved and grows large again. The King and Queen order her to leave the courthouse, but she refuses and insults the Queen. As she does so, she returns to her normal size, and the Queen orders her execution. Alice flees, and the Queen, King, card guards and other characters give chase. When she reaches the small door she encountered at the beginning of the film, he shows her that she is actually already outside, asleep. She yells at herself to wake up; she does thanks to her sister, and they leave the riverbank to go home for tea. Walt Disney was familiar with Lewis Carroll's Alice books (Alice's Adventures in Wonderland and Through the Looking-Glass) and had read them as a school boy. In 1923, he was a 21-year-old aspiring filmmaker working at the Laugh-O-Gram Studio in Kansas City, making the unsuccessful short cartoon series by the name of Newman Laugh-O-Grams. The last of Newman Laugh-O-Grams was called Alice's Wonderland, which was loosely inspired by the Alice books. The short featured a live-action girl (Virginia Davis) interacting with an animated world. Faced with business problems, however, the Laugh-O-Gram Studio went bankrupt in July 1923, and the film was never released to the general public. However, Disney left for Hollywood and used the film to show to potential distributors. Margaret J. Winkler of Winkler Pictures agreed to distribute the Alice Comedies, and Disney partnered with his older brother Roy O. Disney and re-hired Kansas City co-workers including Ub Iwerks, Rudolph Ising, Friz Freleng, Carman Maxwell and Hugh Harman to form the Disney Brothers Studios, which was later re-branded Walt Disney Productions. The series began in 1924 before being retired in 1927. In 1933, Disney considered making a feature-length animated-and-live-action version of Alice starring Mary Pickford. However, these plans were eventually scrapped in favor of Snow White and the Seven Dwarfs, mainly because Disney was put off by Paramount's 1933 live-action adaptation Alice in Wonderland. However, Disney did not completely abandon the idea of adapting Alice, and in 1936 he made the Mickey Mouse cartoon Thru the Mirror. In 1938, after the enormous success of Snow White, Disney bought the film rights of Alice in Wonderland with Sir John Tenniel's illustrations, and officially registered the title with the Motion Picture Association of America. He then hired storyboard artist Al Perkins and art director David S. Hall to develop the story and concept art for the film. A story reel was completed in 1939, but Disney was not pleased; he felt that Hall's drawings resembled Tenniel's drawings too closely, making them too difficult to animate, and that the overall tone of Perkins' script was too grotesque and dark. Realizing the amount of work needed for Alice in Wonderland, and with the economic devastation of World War II and the production demands of Pinocchio, Fantasia, and Bambi, Disney shelved production on Alice in Wonderland shortly after the screening. In fall 1945, shortly after the war ended, Disney revived Alice in Wonderland and hired British author Aldous Huxley to re-write the script. Huxley devised a story in which Lewis Carroll and Alice Liddell (the inspiration for Alice) were misunderstood and persecuted following the book's publication. In Huxley's story, stage actress Ellen Terry was sympathetic to both Carroll and Liddell, and Queen Victoria served as the deus ex machina, validating Carroll due to her appreciation for the book. Disney considered child actress Margaret O'Brien for the title role. However, he felt that Huxley's version was too literal an adaptation of Carroll's book. Background artist Mary Blair submitted some concept drawings for Alice in Wonderland. Blair's paintings moved away from Tenniel's detailed illustrations by taking a modernist stance, using bold and unreal colors. Walt liked Blair's designs, and the script was re-written to focus on comedy, music, and the whimsical side of Carroll's books. Around this time, Disney considered making a live-action-and-animated version of Alice in Wonderland (similar to his short Alice Comedies) that would star Ginger Rogers and would utilize the recently developed sodium vapor process. Lisa Davis (who later voiced Anita Radcliffe in One Hundred and One Dalmatians) and Luana Patten were also considered for the role of Alice. However, Disney soon realized that he could do justice to the book only by making an all-animated feature, and in 1946 work began on Alice in Wonderland. With the film tentatively scheduled for release in 1950, animation crews on Alice in Wonderland and Cinderella effectively competed against each other to see which film would finish first. By early 1948, Cinderella had progressed further than Alice in Wonderland. Through various drafts of the script, many sequences that were present in Carroll's book drifted in and out of the story. However, Disney insisted that the scenes themselves keep close to those in the novel since most of its humor is in the writing. One omitted scene from the 1939 treatment of the film occurred outside the Duchess' manor, where the Fish Footman is giving a message to the Frog Footman to take to the Duchess, saying that she is invited to play croquet with the Queen of Hearts. Alice overhears this and sneaks into the kitchen of the manor, where she finds the Duchess' Cook maniacally cooking and the Duchess nursing her baby. The cook is spraying pepper all over the room, causing the Duchess and Alice to sneeze and the baby to cry. After a quick conversation between Alice and the Duchess, the hot-tempered Cook starts throwing pots and pans at the noisy baby. Alice rescues the baby, but as she leaves the house the baby turns into a pig and runs away. The scene was scrapped for pacing reasons. Another scene that was deleted from a later draft occurred in Tulgey Wood, where Alice encountered what appeared to be a sinister-looking Jabberwock hiding in the dark, before revealing himself as a comical-looking dragon-like beast with bells and factory whistles on his head. A song, "Beware the Jabberwock", was also written. However, the scene was scrapped in favor of The Walrus and the Carpenter poem. Out of a desire to keep the Jabberwocky poem in the film, it was made to replace an original song for the Cheshire Cat, "I'm Odd". Another deleted scene in Tulgey Wood shows Alice consulting with The White Knight, who was meant to be somewhat a caricature of Walt Disney. Although Disney liked the scene, he felt it was better if Alice learned her lesson by herself, hence the song "Very Good Advice". Other characters, such as The Mock Turtle and the Gryphon were discarded for pacing reasons. In an effort to retain some of Carroll's imaginative poems, Disney commissioned top songwriters to compose songs built around them for use in the film. Over 30 potential songs were written, and many of them were included in the film—some for only a few seconds—the greatest number of songs of any Disney film. In 1939, Frank Churchill was assigned to compose songs, and they were accompanied by a story reel featuring artwork from David S. Hall. Although none of his songs were used in the finished film, the melody for "Lobster Quadrille" was used for the song "Never Smile at a Crocodile" in Peter Pan. When work on Alice resumed in 1946, Tin Pan Alley songwriters Mack David, Al Hoffman and Jerry Livingston began composing songs for it after working on Cinderella. However, the only song by the trio that made it into the film was "The Unbirthday Song". While he was composing songs in New York, Sammy Fain had heard that the Disney studios wanted him to compose songs for Alice in Wonderland. He also suggested lyricist Bob Hilliard as his collaborator. The two wrote two unused songs for the film, "Beyond the Laughing Sky" and "I'm Odd". The music for the former song was kept but the lyrics were changed, and it later became the title song for Peter Pan, "The Second Star to the Right". By April 1950, Cahn and Hilliard had finished composing songs for the film. The title song, composed by Sammy Fain, has become a jazz standard, adapted by jazz pianist Dave Brubeck in 1952 and included on his 1957 Columbia album Dave Digs Disney. The song, "In a World of My Own," is included on the orange disc of Classic Disney: 60 Years of Musical Magic. The film soundtrack was first released on LP record on July 28, 1951. The soundtrack was re-released on Audio CD by Walt Disney Records on February 3, 1998. All tracks written by Sammy Fain, Bob Hilliard, Mack David, Al Hoffman, Jerry Livingston, Oliver Wallace, Ted Sears, Gene de Paul, and Don Raye. "Beautiful Soup" – The Mock Turtle and The Gryphon (almost yet deleted characters) set to the tune of the Blue Danube (the Walt Disney Company also used Blue Danube in the two cartoons, Jungle Rhythm and Night). "Everything Has a Useness" – Meant for Caterpillar, in which he explains to Alice that everything has a purpose—in this case, the use of the mushroom. Alice in Wonderland premiered at the Leicester Square Theatre in London on July 26, 1951. During the film's initial theatrical run, the film was released as a double feature with the True-Life Adventures documentary short, Nature's Half Acre. Following the film's initial lukewarm reception, it was never re-released theatrically in Disney's lifetime, instead being shown occasionally on television. Alice in Wonderland aired as the second episode of the Walt Disney's Disneyland television series on ABC on November 3, 1954, in a severely edited version cut down to less than an hour. Beginning in 1971, the film was screened in several sold-out venues at college campuses, becoming the most rented film in some cities. 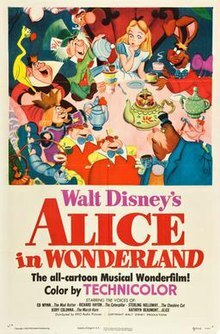 Then, in 1974, Disney gave Alice in Wonderland its first theatrical re-release. The company even promoted it as a film in tune with the "psychedelic times", using radio commercials featuring the song "White Rabbit" performed by Jefferson Airplane. This release was so successful that it warranted a subsequent re-release in 1981. Its first UK re-release was on July 26, 1979. Disney sought to use the new medium of television to help advertise Alice in Wonderland. In March 1950, he spoke to his brother Roy about launching a television program featuring the studio's animated shorts. Roy agreed, and later that summer they spoke to the Coca-Cola Company about sponsoring an hour-long Christmas broadcast featuring Disney hosting several cartoons and a scene from the upcoming film. The program became One Hour in Wonderland, which was aired on NBC on Christmas Day 1950. At the same time, a ten-minute featurette about the making of the film, Operation: Wonderland, was produced and screened in theaters and on television stations. Additionally, Disney, Kathryn Beaumont, and Sterling Holloway appeared on The Fred Waring Show on March 18, 1951, to promote the film. Alice in Wonderland was one of the first titles available for the rental market on VHS and Beta and for retail sale on RCA's short-lived CED Videodisc format. The film was released on October 15, 1981, on VHS, CED Videodisc, and Betamax and again on May 28, 1986, on VHS, Betamax, and Laserdisc. In January 2000, Walt Disney Home Video launched the Gold Classic Collection, with Alice in Wonderland re-released on VHS and DVD on July 4, 2000. The DVD contained the Operation: Wonderland featurette, several sing-a-long videos, a storybook, a trivia game, and its theatrical trailer. A fully restored two-disc "Masterpiece Edition" was released on January 27, 2004, including the full hour-long episode of the Disney television show with Kathryn Beaumont, Edgar Bergen, Charlie McCarthy and Mortimer Snerd, Bobby Driscoll and others that promoted the film, computer games, deleted scenes, songs and related materials, which went back on moratorium[clarify] in January 2009. Disney released a 2-disc special "Un-Anniversary" edition DVD on March 30, 2010, in order to promote the new Tim Burton version. The movie was released in a Blu-ray and DVD set on February 1, 2011, to celebrate its 60th anniversary, featuring a new HD restoration of the movie and many bonus features. Disney re-released the film on Blu-ray and DVD on April 26, 2016, to celebrate the film's 65th anniversary. Bosley Crowther, reviewing for The New York Times, complimented that "...if you are not too particular about the images of Carroll and Tenniel, if you are high on Disney whimsey and if you'll take a somewhat slow, uneven pace, you should find this picture entertaining. Especially should it be for the kids, who are not so demanding of fidelity as are their moms and dads. A few of the episodes are dandy, such as the mad tea party and the caucus race; the music is tuneful and sugary and the color is excellent." Variety wrote that the film "has an earnest charm and a chimerical beauty that best shows off the Carroll fantasy. However, it has not been able to add any real heart or warmth, ingredients missing from the two tomes and which have always been an integral part of the previous Disney feature cartoons." Mae Tinee of the Chicago Tribune wrote that "While the Disney figures do resemble John Tenniel's famous sketches, they abound in energy but are utterly lacking in enchantment, and seem more closely related to Pluto, the clumsy pup, than the products of Carroll's imagination. Youngsters probably will find it a likable cartoon, full of lively characters, with Alice's dream bedecked with just a touch of nightmare—those who cherish the old story as I have probably will be distinctly disappointed." 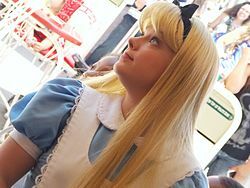 Alice in Wonderland was met with great criticism from Carroll fans, as well as from British film and literary critics, who accused Disney of "Americanizing" a great work of English literature. Walt Disney was not surprised by the critical reception to Alice in Wonderland—his version of Alice was intended for large family audiences, not literary critics—but despite all the long years of thought and effort Disney invested in it, the film met with a lukewarm response at the box office and was a sharp disappointment in its initial release. Additionally, he remarked that the film failed because it lacked heart. In The Disney Films, Leonard Maltin says that animator Ward Kimball felt the film failed because "it suffered from too many cooks—directors. Here was a case of five directors each trying to top the other guy and make his sequence the biggest and craziest in the show. This had a self-canceling effect on the final product." Since the film's revival in the 1970s, critics have re-evaluated the film and it has since been considered a classic. On the film aggregator website Rotten Tomatoes, Alice in Wonderland received an approval rating of 79% from 29 critical reviews with an average rating of 6.37/10. The consensus states, "A good introduction to Lewis Carroll's classic, Alice in Wonderland boasts some of the Disney canon's most surreal and twisted images." During its initial theatrical run, the film grossed $2.4 million in domestic rentals. Because of the film's production budget of $3 million, the studio wrote off a million-dollar loss. The film was nominated for an Academy Award for Best Scoring of a Musical Picture, but lost to An American in Paris. Alice in Wonderland has been condensed into a one act stage version entitled, Alice in Wonderland, Jr.. The stage version is solely meant for middle and high school productions and includes the majority of the film's songs and others including Song of the South's "Zip-a-Dee-Doo-Dah", two new reprises of "I'm Late! ", and three new numbers entitled "Ocean of Tears", "Simon Says", and "Who Are You?" respectively. This 60–80 minute version is licensed by Music Theatre International in the Broadway, Jr. Collection along with other Disney Theatrical shows such as Disney's Aladdin, Jr., Disney's Mulan, Jr., Beauty and the Beast, Disney's High School Musical: On Stage!, Elton John and Tim Rice's Aida, and many more. In Donald in Mathmagic Land, Donald Duck wears Alice's dress and has her hairstyle but brown not blond. A larger pencil bird is in the film as well. Bill the Lizard appears as one of Professor Ratigan's henchmen in The Great Mouse Detective. Alice and several other characters from the film were featured as guests in House of Mouse, and the Queen of Hearts was one of the villains featured in Mickey's House of Villains. The Mad Hatter was also featured in Mickey's Magical Christmas: Snowed in at the House of Mouse. The Mad Hatter and the March Hare were also featured in several episodes of Bonkers. Bill the Lizard, Tweedledum, Cheshire Cat and the doorknob also appear in the 1988 Disney film Who Framed Roger Rabbit. In the opening of Aladdin, the peddler tries to sell a hookah much like the one the Caterpillar used. In Aladdin and the King of Thieves, the Genie turns into the White Rabbit. Weebo shows clips of the film on her screen in Flubber. An episode of Mickey Mouse Clubhouse, entitled "Mickey's Adventures in Wonderland", is based on the film. During the song "When You Wish upon a Star" in Disney's Pinocchio, the Alice in Wonderland book can be seen on the bookshelf where Jiminy Cricket is singing from. This reference can be considered indirect as the film was released 11 years prior to Alice in Wonderland. A live-action adaptation of the animated film and based on Carroll's works, Alice in Wonderland, directed by Tim Burton, was released in 2010. It spawned a sequel, Alice Through the Looking Glass, directed by James Bobin and released in 2016. Costumed versions of Alice, The Mad Hatter, The White Rabbit, The Queen of Hearts, Tweedledum, and Tweedledee make regular appearances at the Disney theme parks and resorts, and other characters from the film (including the Walrus and the March Hare) have featured in the theme parks, although quite rarely. More famously, all five Disneyland-style theme parks feature Mad Tea Party, a teacups ride based on Disney's adaptation of Alice in Wonderland. Alice in Wonderland is also frequently featured in many parades and shows in the Disney Theme Parks, including The Main Street Electrical Parade, SpectroMagic, Fantasmic!, Dreamlights, The Move It! Shake It! Celebrate It! Street Party and Walt Disney's Parade of Dreams. Disneyland contains a dark ride based on the film in addition to the teacups, and Disneyland Paris also contains a hedge maze called Alice's Curious Labyrinth, which takes its inspiration from the film. The now-defunct Mickey Mouse Revue, shown at Walt Disney World and later at Tokyo Disneyland, contained characters and scenes from the film. In Disney's Villains' Revenge, the Queen of Hearts is one of the villains who tries to turn the ending to her story to where she finally cuts off Alice's head. Mickey Mousecapade features various characters from the film. The Japanese version, in fact, is based very heavily on the film, with almost every reference in the game coming from the film. A video game version of the film was released on Game Boy Color by Nintendo of America on October 4, 2000 in North America. Additionally, in the video games Kingdom Hearts and Kingdom Hearts: Chain of Memories, Wonderland is a playable world. Alice is also a major character in the overall plot of the first game due to her role as one of seven "Princesses of Heart". Other characters from the movie that appear include the Queen of Hearts, the Cheshire Cat, the White Rabbit, the Doorknob, the Caterpillar (V Cast only), and the Deck of Cards. The Mad Hatter and the March Hare appear in portrait form as well. All except the Doorknob also appear in Chain of Memories, albeit in the form of illusions made from the main character's memory. While the world is absent in Kingdom Hearts II, it returns in Kingdom Hearts 358/2 Days and Kingdom Hearts coded, the latter featuring a digitized version of the world originating from data in Jiminy Cricket's royal journal. In Toy Story 3: The Video Game, the Mad Hatter's hat is one of the hats you can have the townsfolk wear. In Kinect Disneyland Adventures, Alice, Mad Hatter, White Rabbit, and the Queen of Hearts make appearances. In Disney Infinity, there are power discs based on Alice in Wonderland. Several characters of the movie make appearances throughout the Epic Mickey-games. For example, the cards are seen throughout Mickeyjunk Mountain in the original Epic Mickey, Alice appears as a statue carrying a projector screen in Epic Mickey 2 and Alice, the Mad Hatter, the Cheshire Cat and the Queen of Hearts appear as unlockable characters in Epic Mickey: Power of Illusion. ^ a b "Alice in Wonderland: Detail View". American Film Institute. Retrieved May 18, 2014. ^ "ALICE IN WONDERLAND (U)". British Board of Film Classification. July 3, 1951. Retrieved June 18, 2015. ^ a b Barrier 2008, p. 230. ^ a b c d e f g h i Alice in Wonderland: 60th Anniversary Edition - Through the Keyhole: A Companion's Guide to Alice in Wonderland (Blu-Ray). Walt Disney Studios Home Entertainment. 2011. ^ Barrier 1999, p. 38–9. ^ a b c d e Alice in Wonderland: Special Un-Anniversary Edition - Reflections on Alice (DVD). Walt Disney Studios Home Entertainment. 2010. ^ a b Gabler 2006, p. 486. ^ Barrier 1999, p. 392. ^ a b Gabler 2006, p. 459. ^ Braun, Amy (March 4, 2008). "UltimateDisney.com's Interview with Lisa Davis, the voice and model for 101 Dalmatians' Anita Radcliff" (Interview). DVDizzy. ^ Barrier 1999, p. 398. ^ Alice in Wonderland: 60th Anniversary Edition - Deleted Scene: "The Pig and Pepper" (Blu-Ray). Walt Disney Studios Home Entertainment. 2011. ^ a b Bohn, James (2017). "Alice in Wonderland and Peter Pan". Music In Disney's Animated Features: Snow White and the Seven Dwarfs to The Jungle Book. University Press of Mississippi. ISBN 978-1496812148. ^ Sammy Fain (August 22, 1978). "Sammy Fain". Walt's People—Talking Disney with the Artists who Knew Him, Volume 12 (Interview). Interviewed by David Tietyen. ^ "Songs From Alice in Wonderland". Sound of Vinyl. Retrieved November 12, 2018. ^ "Walt Disney's Alice In Wonderland: Classic Soundtrack Series: Sammy Fain, Bob Hilliard". Amazon.com. Retrieved July 13, 2010. ^ "Alice in Wonderland Premieres in England". D23. Retrieved June 25, 2018. ^ a b Crowther, Bosley (July 30, 1951). "THE SCREEN IN REVIEW; Disney's Cartoon Adaptation of 'Alice in Wonderland' Arrives at Criterion". The New York Times. Retrieved January 6, 2019. ^ a b "Alice in Televisionland". The Walt Disney Family Museum. April 4, 2011. Retrieved June 25, 2018. ^ Harmetz, Aljean (April 22, 1974). "'Alice Returns', Curiouser and Curiouser". The New York Times. Retrieved June 25, 2018. ^ Barrier 2008, p. 228. ^ Seideman, Tony (April 12, 1986). "Prices Tumble as Disney Enters Its 'Wonderland' Campaign". Billboard. Vol. 98 no. 15. p. 52. ^ "Imagination for a Lifetime -- Disney Titles All the Time; Walt Disney Home Video Debuts the "Gold Classic Collection"; An Animated Masterpiece Every Month in 2000" (Press release). Burbank, California. Business Wire. January 6, 2000. Retrieved June 25, 2018. ^ "Alice in Wonderland — Disney Gold Collection". Disney.go.com. Archived from the original on August 15, 2000. Retrieved June 25, 2018. ^ "Official DVD website". Disney.Go.com. Archived from the original on July 25, 2010. Retrieved July 13, 2010. ^ Justin Sluss (July 28, 2010). "A Hi-Def sneak peek at Disney's planned 2011 Blu-ray titles". highdefdiscnews.com. Retrieved October 7, 2010. ^ "'Alice in Wonderland' Enchanting Walt Disney interpretation of Lewis Carroll classic; bright b.o." Variety. July 4, 1951. p. 8. Retrieved January 6, 2019 – via Internet Archive. ^ Thomas, Bob (1976). Walt Disney: An American Original. New York: Hyperion Press. pp. 220–221. ISBN 0-7868-6027-8. ^ "Alice in Wonderland: The Aftermath". Disney.go.com. Archived from the original on August 10, 2007. Retrieved June 25, 2018. ^ Gabler 2006, p. 487. ^ Maltin, Leonard (1973). The Disney Films. New York: Crown. p. 103. ISBN 0-7868-8527-0. ^ "Alice in Wonderland Movie Reviews, Pictures". Rotten Tomatoes. Flixster. Retrieved June 25, 2018. ^ "The Top Box Office Hits of 1951". Variety. January 2, 1952. p. 70. Retrieved June 25, 2018. ^ "Romanization". Retrieved July 13, 2010. ^ "Disneyland's Mad Tea Party Page". Archived from the original on June 20, 2010. Retrieved July 13, 2010. ^ "Disneyland Paris' Alice's Curious Labyrinth Page". Archived from the original on January 5, 2009. Retrieved July 13, 2010. ^ "Kingdom Hearts Official Page". Retrieved July 13, 2010. Barrier, Michael (April 8, 1999). Hollywood Cartoons: American Animation in Its Golden Age. Oxford University Press. ISBN 978-0-19-802079-0. Wikimedia Commons has media related to Alice in Wonderland (1951 film).